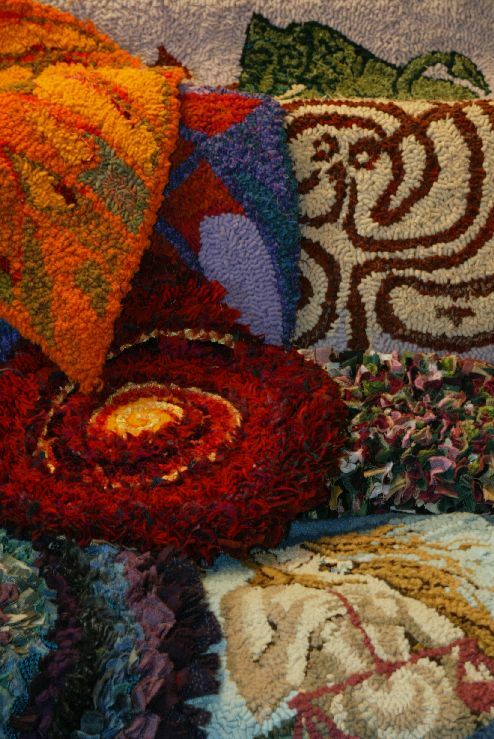 RAG RUGS were made from old clothes or mill waste since the 19th century. Revived in the 1930s and 1940s the craft is now a hands-on sustainable lifestyle activity. Jenni Stuart-Anderson uses recycled and vintage textiles to make customised rugs and wall-works with contemporary designs and she offers courses on the traditional rag rug techniques of Hooking, Progging (Prodding) and Plaiting (Braiding). These techniques are explained in her books RAG RUG MAKING (2003,7,10,11,14) currently sold out, and MORE RAG RUGS & Recycled Textile Projects (2011) obtainable from the author. Jenni welcomes commissions for recycled textile projects. Please email Jenni for details without obligation. 2012 marked the bicentenary of the textile workers’ uprising under the banner of Luddism. See more at Trouble at t’mill.